Setup was easy. You can configure different folders on your laptop where photos and videos should be copied, and you can configure different sharing sites where they can each be automatically uploaded. You can also configure email addresses where it will notify you when it begins uploading and when it completes uploading. You can setup multiple wireless ssid and passwords for various places you might be. We just have it setup for home. You can also configure whether you want photos and videos to automatically be deleted off the card when it gets too full, e.g. over 50%. Having done all that, I've not needed to remove the card from the camera again. Each time we get home after taking photos, we just turn the camera on and put it on a table. It sends an email as it starts to upload, and it sends an email when it finishes. The only downside is that this drains the batteries quicker, so we're finding ourselves recharging them more often. I'm also glad I didn't spend the extra for the Pro model with geotagging. It uses Wi-Fi positioning system (WPS) from a third party called Skyhook. 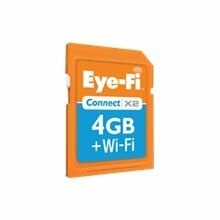 The Eye-Fi card detects wireless networks around the camera when a photo is taken. This is checked against the Skyhook database to estimate your location. Their coverage is pretty good in urban areas, but non existent in a lot of the rural and small towns where I'll be using my camera. You can check an address on the Skyhook coverage map to see whether it's worth it for you. We've been using the Eye-Fi Connect X2 SD card for one month now, and I'm very happy with the purchase.